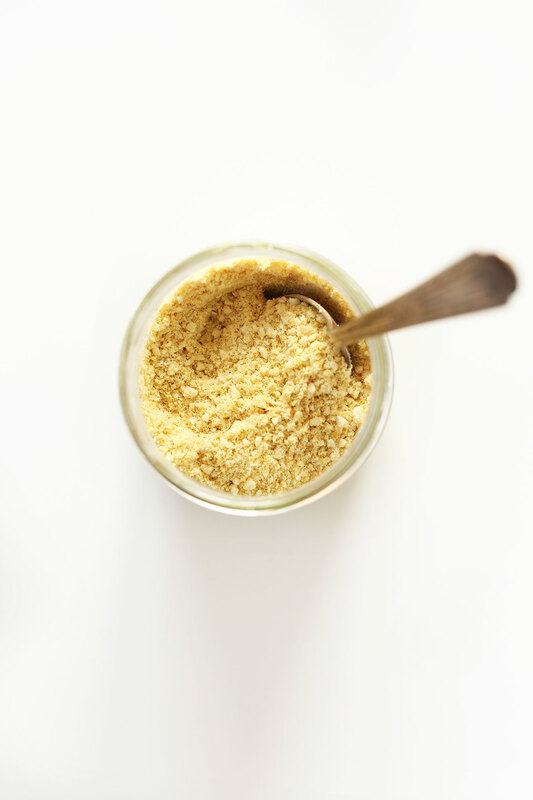 Easy, 4 ingredient vegan parmesan cheese that's perfect on top of pastas, pizza and anywhere you'd usually use parmesan cheese! I love vegan parmesan on top of chilaquiles, vegan pizza, breadsticks, pastas and gratins. It's also a great addition to vegan meatballs and can be converted into mexican cheese 3 ways! *This is not my original recipe, but one I learned from other vegan bloggers and have adapted for my own use! *Recipe (as originally written) makes ~1 cup. new vegan here, and i just made this. uuuuuhhhhh-maaaaa-zzaaaannnggg, people!!!! used it to top a zucchini noodle dish. uuuuhhhh-maaaa-zaaaannggg, people!!! this is the reason i got a food processor (and i am noooott sorry). So glad to hear you enjoyed this recipe on your pizza, Pam! Thanks for the lovely review! I must say I was a cheese devoted for my entire life, so it was a hard turn when I decided to go vegan. I thought it was just a life of privations, but I recently found your blog and now it just feels it’s all about creative cooking. This recipe is great, quick to make (about 5 min counting the cleaning of the supplies) and it yields several servings. It tastes delicious and makes my life a little bit better, which is all you need from a recipe. I like roasting nuts. Any problem if cashews aren’t raw? I looked for an answer to this but Comments section is pages long! I’ll try this anyway. Has to be good! We think so! Let us know if you give that a try! For future reference, if you press “ctrl+f” on a PC or “command+f” on a mac, a find bar should pop up that allows you to search for specific words in the post and comments. Hope that helps! Substitute for tree nuts allergies? I replace the cashews with sunflower seeds and pepitas because I prefer the taste. I do 1/4 cup of each and then do the last 1/4 cup as a combo of each. I use sesame seeds. It gives it a kind of gomasio vibe. I made this with whole raw almonds instead of cashews! Excellent!!!! I forgot to rate it. I give it 5 stars! I doubled the garlic and added 1/4 teaspoon of ground mustard, 1/4 teaspoon onion powder, and 1/2 teaspoon of vinegar to make it a little more sticky (it was like a powder before). It is delicious! This stuff is sooo good that my 2 year old eats it with a spoon, straight out of the container I keep it in! Just wondering if anyone has attempted making this with roasted lightly salted cashews. I had intended to make this tomorrow night, but my husband accidentally bought the roasted salted cashews…misunderstanding that I had asked him to get raw. How long does this stay fresh in the fridge? Others have had success using their vitamix, so it should work, though you’ll get best results in a food processor! This recipe works great in my Vitamix. So delicious and the best comfort food! I made it twice: once with Toffutti and a second time with Kite Hill cream cheese. The Toffutti made the pasta a lot creamier. Be sure to let the almond milk sit in the pan for longer if you want a creamier cheese sauce. Amazing! My meat eating husband gave it the thumbs up and that’s the ultimate test! I just made my second batch of this after we couldn’t eat the first one fast enough! It’s truly delicious and we sprinkled it on anything from pasta to potatoes to soup. This time around I made a double batch. We enjoyed this so much more than any of the vegan parmesan we’ve bought. I’ll never buy them again, not when this is so yummy and easy to make. Thanks for the recipe! Loved the recipe, but it still tasted a bit sweet, so I added about another 2 Tbsp nutritional yeast and 1.5 Tbsp of lemon juice. It gives the ‘cheese’ some parm-y bite! Since i don’t like nutritional yeast I substituted it for pepitas. It’s still great! Love this recipe. To make it even easier, I used almond meal. I just dumped everything in a jar, put a lid on it, and shook it until everything was mixed. Yummy! i just made a batch of this ‘cheese’ and it’s pretty salty, but i think it’s supposed to be? I usually cook with kosher salt and i’ve read not all salts are the same. Just curious if your sea salt is super fine like mine or more like the texture of kosher salt. Whoop! Thanks for sharing, Kasandra! I just have to tell you I just made this… and it’s really good! I’ve recently decided to stop eating dairy and Parmesan cheese was basically like my favorite thing. I’m so excited to try some of your other recipes! Can or should I soak the cashews? Absolutely delicious. Even my non vegan family members loved it! This is something I’m always going to have in the fridge. We are glad everyone enjoyed it, Meg! YUMMMMM! This turned out so good. I originally made up a batch of this to use with your recipe for Eggplant Parmesan, but I have already found many other uses for it, including what might be my favorite- sprinkled on avo toast!!! I don’t ever want to run out of this stuff. I made this in addition to your vegan Alfredo sauce.. holy yum!! So so good! Suffering with allergies to all sorts of things, and it’s so wonderful trying out your recipes and falling in love with ‘cheesy pasta’ dishes again!! Question.. what is the best way to keep the left over vegan Parmesan, and how long will it keep? Fridge or freezer? What nut would you use if you can’t have cashews or peanuts? Hemp seeds, perhaps? See the other comments above for tips! HOLY SMOKES. This stuff is no joke, it’s so good!! Just made it for the first time and I can hardly stop eating it. Wow! Nothing else to say but Wow! O and it is surprisingly parmesan like. Glad to hear that, Jill! I make this all the time and love it! I leave out the salt and don’t even notice. Sometimes I sub some pumpkin seeds for part of the cashews. My family also lives zero-waste, so I love that I can buy everything in the recipe from the bulk bins. Thanks for creating such a great recipe! Smart! Glad you enjoyed it, Sadie! Wow! the only food I have missed transitioning to a WFPB lifestyle is my cheese especially over pasta and in other recipes. Thank you so much. We are glad you enjoyed it, Cindy! Thank you so much! I have been giving everyone this recipe! I absolutely LOVE cheese and it has been so hard to give it up. All the cheese stuff I have tried tastes horrible so I would just do without but I thought I would give it one last try with your recipe since I had some raw cashews laying around. This is wonderful!!!! Granted it is not exactly like the real stuff but it has a fantastic taste on its own and it makes my plain pasta sauce not only edible but delish! Thank you again, I look forward to trying your other recipes. We are so glad you enjoyed it, Anne! For those who are nut free, a mix of 1/2 cup hemp seeds and 1/4 cup pepitas worked as a great substitute for cashews. This is delicious! How big is the serving size for the nutritional information provided? The ABSOLUTE BEST. A staple I make over and over again. Cashews are my fav, but I have also done walnuts and almonds, both delicious. Adds such an amazing flavour to everything. Yay! Thanks for sharing, Beth! This recipe is fantastic even my 8month old baby loved it! Thank you for making vegan recipes that are easy and simple. It is crazy how tasty this recipe is! I am ashamed that I didn’t try to make it earlier! I am in love. Glad you enjoyed it, Scott! I found this so simple and easy. It taste very similar to grated Parmesan but more nutritious! Dana- perfect recipe! I’ve been using it for weeks and love it, thanks for making it so simple! This is a great recipe, tasty and easy to put together on a weeknight. I shared some with a co-worker who had forgotten her lunch at home and she wanted the recipe. If I had known vegan cheese substitutes could taste so good I would have tried this years ago. Better taste than dairy I dare to suggest and without the “barf smell” of dairy Parmesan! I am going to add this to everything, so tasty! Just made this. So good! Thank you for sharing all of these wonderful vegan recipes. I made this about 10 days ago and kept the leftovers in an air sealed container in the fridge. Is it still okay to use? Yes, it will keep for several weeks! This turned out GREAT! We had just been using plain nutritional yeast on pasta, but this is so much yummier :) ! Based on some other reviews, I started out with 1/2 tsp of salt and found that it was perfect for us. Yay! Thanks for sharing, Tanya! Great recipe! Just made it and used it in my first vegan risotto with asparagus ?. That’s about the only thing i’ve missed since going vegan. So easy to make, even with my basic Bosch blender. The taste is perfect and tastes so much like parmesan. Thank you! 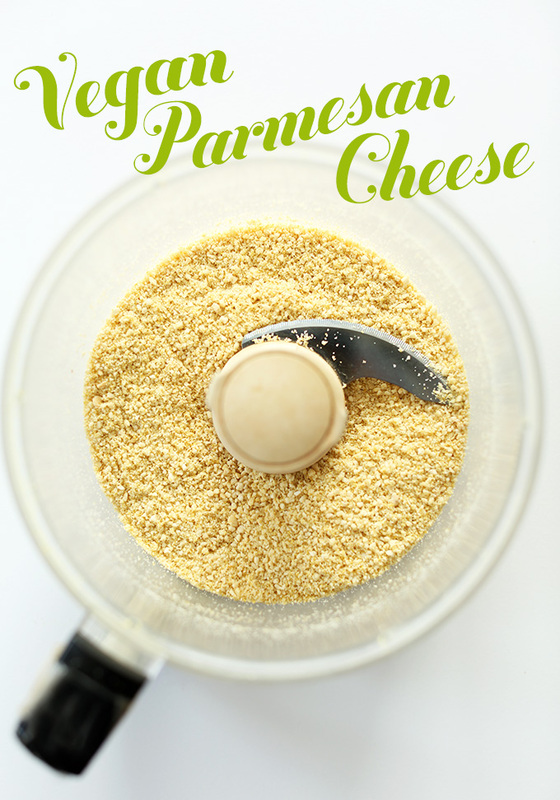 This is my go-to recipe for vegan parm! I didn’t modify the recipe at all…but have made it so many times now that I no longer need to measure the ingredients. This was a Godsend when I was first trying to roommate dairy, and I still love it! Vegan Parmesan Cheese and 5 Ingredient Vegan Parmesan Cheese each call for 3/4t. sea salt and the accompanying 3 recipes, each using the vegan parmesan cheese recipe to start, call out 1/4t. sea salt. Is this a mistake ? Seems like an awful lot of salt. Thanks for your feedback! Feel free to scale back on the salt if you feel as though it is too much! I have used sun flower seeds and they tasted really good. Son has nut allergy. I am trying to make a creamy pasta dish that calls for ½ cup Parmesan Cheese , would the substitution ratio be the same, ½ cup of this vegan cheese? Yes, I would substitute the same amount as regular parm! I make this recipe all the time. When I run out, I make it again. I love it! Sorry if this has already been asked ( so many comments to sift through), can you also use roasted/salted cashews? Will it affect the flavour and/or nutritional component? I think so! Let me know if you give that a try, Tammy! This was the first vegan parmesan I tried making, and it’s so good that I most likely won’t even try any new recipes. Simple, quick to make, tastes fantastic and keeps a long time in the fridge. I mostly use it to top off my pasta dishes, but it’s also fantastic for pizza. No local pizza place has vegan cheese, so I just order a cheeseless pizza and top it with this golden stuff as soon as it arrives. SOOO good! Can a big batch of this be made and stored? Does it need to be kept in the fridge or can it be kept on the shelf? All the ingredients on their own are shelf stable, so I’m curious. Thanks! You could store it on the shelf, but it will keep longer when stored in the refrigerator! Do the cashews need to be soaked first? Made this tonight to go on pasta. It was a triumph. My 10yr old daughter wanted to know how I made parmasan without it being cheese! Thanks for sharing. i used almond flour because i was looking for a way to use it up and it worked perfectly!! it tastes great and i normally cant stand nutritional yeast but in this recipe its perfect. Thank you, thank you, thank you! I made it exactly as the recipe is written and it’s fantastic. Used it tonight on zucchini noodle “spaghetti” with “meatballs” and it was amazing. I’m not currently vegan but working my way there and have been trying every “cheese” recipe I can find lol. This is hands down the best! How well does this melt (e.g pizza topping)? — thank-you! Dana, this is incredible! So so simple and absolutely delicious!! I think I’ll need to make a bigger batch next time – definately putting this on everything!! You and your husband’s blog has opened my eyes to how quick yummy food can be made, and after just transitioning to vegan you’re making cooking so exciting and delicious! Just made this to top a sweet potato lasagna and will use for minestrone later this week, thanks, helpful and delicious! Always helpful to find cheese options in the vegan world! seeing an advertisement with a rare steak on a vegan page – so annoying. Walmart, btw. This was delicious! It seemed a little on the salty side, but that could be because I was eating spoonfuls of it… I used whole, raw almonds, and the texture and flavor are great! I’ll definitely be making it again! Hi Dana!! This is my first time giving a comment – but I have made so many of your recipes, but this one and the red pepper roasted pasta are my favorite!!!! Oh my goodness we my daughter and I just made this and it is awesome!! We taste tested it with the store bought vegan Parmesan cheese and we both agreed it is so much tastier. Guess I will be saving some money by making my own from now on. Thanks so much! hi dana, can i freeze this in ? I made this with raw pumpkin seeds which I dry roasted myself and it came out great! I used a little less of the pumpkin seeds, about 1/2 a cup. I made it with Pumpkin seeds because of sensitivity to Cashews and Almonds. Thank you Dana for the inspiration. Anybody tried it with regular salted cashews (not raw)? Hi Alex! Raw cashews are needed to achieve the right texture! Wow! Simply amazing. Even my non-vegan family likes it! Hi Tony! You’ll want to add the 3 tbsp of nutritional yeast along with all ingredients to a food processor and mix/pulse until a fine meal is achieved. Hope this helps! Do i soak the cashews? I made this last night and learned that it’s not helpful to soak the cashews as I normally do in water for a few hours. They went in wet to my food processor and the result was a gummy mess. It still tastes great but doesn’t have the consistency or texture of Parmesan cheese. I’m not giving up though! I’ll try this once more with dry cashews. Absolutely fantastic!!! Thanks for sharing!! But the flavor is excellent! I can’t wait to try this again without soaking them lol. I didn’t have garlic powder so I substituted both the salt and the powder for a tbs of garlic salt, still delicious. My 10 year old son is allergic to all nuts EXCEPT ALMONDS. Ou family is strictly plant based…do you have a suggestion for substituting the cashews? Even though we love being vegan I personally miss parmesan on my Italian dishes! Do you think slivered almonds would work? Hi Wendy! We haven’t tried it, but many have and had success with using slivered almonds! I made this tonight and it was sooo easy and sooo delicious! My husband and 6 year old sprinkled it on everything (veggies and pasta) and we all agreed it tastes better than real parmesean. Thank you for the recipe! I grate some Brazil but right over my plate. This is so delicious! I enjoyed it on pasta and will add it to my cauliflower crust pizza! The flavor is amazing. Thank you so much for creating and sharing! Is there a special way to store it? How long will it last? Thanks! Hi Reachael! Store in the refrigerator in an air tight container to keep fresh. Lasts for several weeks! This is amazing. Has a perfect texture and the flavor is incredible! Great recipe. Absolutely perfect! A delicious substitute that I’ve made over and over again. Thanks for sharing, it’s SO GOOD! Hi do you think it’s would be ok to replace parmesan in a caesar salad? Hi Marie! That should work! I put this on popcorn. AMAZING. I was a little skeptical but decided to give this recipe a try as we use Parmesan often in our cooking – not hearth healthy, I know. I tastes amazing, not the same as the real deal but I totally see myself using it in my cooking on a regular basis. So happy we discovered this! My husband and I love this and put it on/in EVERYTHING! Perfect topping for pizza, salad, soups…literally I would love to just eat this with a spoon. Thanks for the recipe. I did sub a clove of finely chopped garlic for the garlic powder because that’s what I tend to have on hand. Thank you Dana this is delicious!! We always keep it on hand now. I also use it to make my 2 year old daughter’s vegan mac&cheese. We blend 2 Tbsps of it with 2 Tbsp EV Olive Oil + 1/4 cup unsweetened organic soy milk + tumeric (for color and health). She would eat it everyday if I let her. I used a touch less nutritional yeast as I hate the stuff normaally but it tasted fine in the meal. I also added a couple of drops of lemon juice. Both vegans and non vegans agreed it was good. Boiling spaghetti as i write this. Your recipe Dana was perfect as is, as always. I wanted to experiment a little and, added half cashews and half almonds. It was so, so GOOD!!!!! 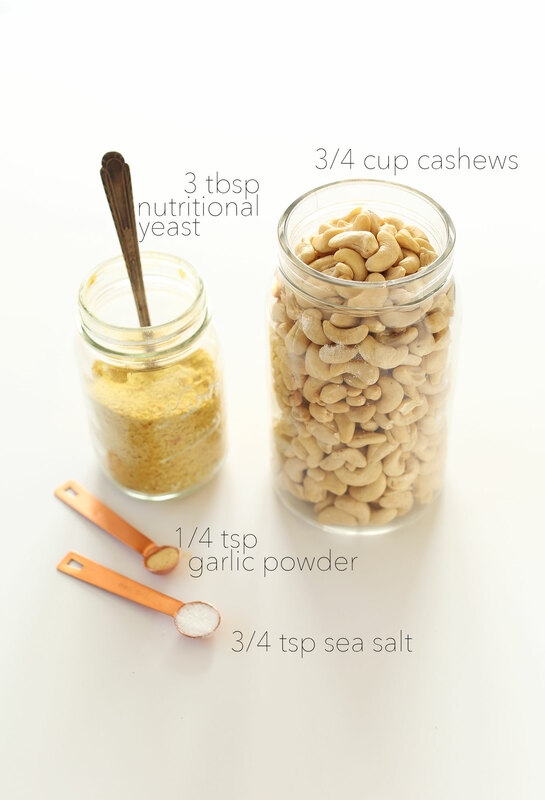 I substituted the cashews hews for pine nuts (allergies) and it worked so well. Doubled the garlic powder and used onion salt instead of plain salt. Beautiful and will be used regularly in to kitchen! Just made this and it is good. I will definetly continue to use it on my pasta recipes! Maybe because I’ve only recently given up dairy, but this didn’t really taste like Parmesan cheese to me. Having said that, it was delicious in its’ own right (I caught myself eating some by itself by the spoonful). And talk about easy! Less than five minutes, start to finish, including measuring the ingredients and dragging out my mini-prep processor from the cabinet. This is a keeper. I have made this so many times but I wanted it a little different this time to more easily get omega 3s. This time I subbed walnuts in an exchange for cashews and it was a delight. I loved it! I can’t say that is as delicious as the cashews but it still tuned out really good tasting in my opinion. Do you soak the cashews first? Hi! Don’t soak the cashews otherwise it will end up gummy! I love this recipe and make it weekly. My husband loves it and puts in on everything! Thanks for the Delicious! I was surprised at how well this worked! Thanks! Thank you, thank you, thank you! Parmesan cheese is the only thing I have missed since I went vegan. This is fantastic! Thank you again! OMG I would have never believed this could taste like Parmesan but it actually does!!! I used half slivered almost nds half cashews as she thought cashews alone would be sweet. AMAZING. thank you so much for sharing!! Do you need to soak the cashews before blending?? Oh my word, this is just a game changer!!! Thank you for sharing! I am newly vegan and made this to go with my mushroom risotto, delicious! Can you use this vegan parmesan cheese be used to to make pesto? Hmm I am not sure, but we have an easy pesto recipe for you here! Hey, how and how long can I keep this mix for ? Hi! It will last for several weeks if kept in the refrigerator! Has anyone tried this with almond meal?? I usually have a batch of this in the fridge as it’s a staple for me. I love it. I have discovered a new way I like even more. I add a fresh clove of garlic (or two) with or without the garlic powder. Then you get these cheesy/garlicky clumps in your pasta and it is to die for. Thanks for this fabulous recipe!! Made this and it was lovely. My 9 year old loved it as well and he’s picky. Oh and forgot to mention, I made it with a mix of macadamia, silvered raw almonds, brazil nuts and walnuts. I think you can use many different nuts – whatever you have on hand. I LOVE this vegan parmesan. Not exactly like real parm of course, but adds that extra taste I was missing! Flavorful and totally addictive! I love this stuff so much, I could eat it by the spoon full. Great on cauliflower pizza, pasta dishes, even mixed into a bowl of leftover quinoa or brown rice for a quick little snack! This is AMAZING!!!! I’m mak meatless meatballs!!!! Thank you Dana!!! My amazing lifesaver!!!! Super-picky family loved this. One vegan kid, one “regular” kid, and two gluten-free/dairy-free people gave it the thumbs up! Yay! I haven’t had too many “wins” yet with this new way of eating. This is amazing! Perfect balance. Everyone loves it! I was really missing parmesan cheese after making a diet change. This recipe is excellent. I first tried on plain ole spaghetti and sauce, and it was quite satisfying. It added a nice texture and put back that savory added taste I was missing after cutting out real cheese. I then made a cheese-less pizza. Bought some dough at the Italian grocery store, added some sauce, sautéed onions and garlic, oregano, pepper, olive oil, chopped up sardines (no added salt in spring water), and then the vegan “cheese” from your recipe. Came out really nice. I did not miss the mozzarella cheese too much. Didn’t burn the roof of my mouth either! Thank you for the great recipe. can you use roasted cashews? Hi Karrie! I think so, but I haven’t tried it so I can’t guarantee the results. I just discovered your page, and I’m already loving it. Being from Europe, I especially appreciate the recipes where you also include weight measures when using cups. Sometimes this can be the barrier when choosing which new recipe to try out. Hey, y’all! I just found this blog and recipe. Not sure if anyone has already related this but in case they haven’t, for all the ALMOND users, you’re doing too much work….just use the almond meal already processed and you won’t risk over-processing the almonds (or any other nut for that matter when you purchase that particular nut in a “meal” or “flour” grade). It works great. Our toddler has a severe allergy to cashews (but my husband and I do not.) I know a lot of vegan recipes out there call for cashews. Anything else I could use instead and get similar results? Also, I LOVE your website and have tried several recipes- they all taste great!!! :) The pictures are so beautiful and recipes are easy to follow! Hi Angela! We haven’t tried this, but other readers have suggested using sunflower seeds (without the shell) as a nut alternative for the Vegan Parmesan Cheese. As for other recipes, it will definitely vary but sometimes tofu can be used in place of cashews! Check out the comments from other readers, they often have great suggestions for substitutions! I was making some pasta and remembered reading this (have recently discovered your blog!) and thought “well – why not throw it together”… and that’s all it took and the whole family is hooked! It’s so incredibly quick and easy (and rather guilt-free since – it’s so healthy). We’ve been pushed down the road to more and more vegan eating by our kid’s deadly allergy to milk… so this is amazing. Totally satisfies the other kid and our old cravings. Very yummy! This “Parmesan” has become a staple in our house. It is utterly delicious and I find myself sprinkling it on just about every savory food! Nutritional yeast offers numerous health benefits so for those of you who are asking about omitting it from the recipe, it is worth tracking it down for that reason, in addition to the flavor it adds. Going to have a crack at making this today, so that I can then make the vegan mac cheese! I’m from England and just want to say that I love the fact you put weight measures in your recipes as I much prefer to cook by weight than cup measures! Thank you. I made three batches of this before i finally settled on a combination i felt comfortable with. I used ‘NOW’ brand de-bittered brewers yeast and with 3Tbsp the ‘cheese’ was very bitter. I was worried about making my famous chicken parm (all the work of making my homemade tomato sauce) and having a strange bitter aftertaste. *BLEH* – so i tried dropping it down to 2 Tbsp — a little better. Still there was that bitter aftertaste. And then i dropped it to 1 Tbsp, and while it’s def milder and less cheesy at least it’s not extremely bitter. I also upped the garlic and salt by about 1/8 tsp. You should be using nutritonal yeast, not brewers yeast. This is my “go to” recipe for vegan parmesan and I love it, as do all of the non-vegans that I share it with. No need for any other recipe – this one hits the spot. I’m so excited to fing this recipe! Do you soak the cashews first? Thanks. No soaking required for this recipe! Just made this, it is delicious and so simple! Made it in my vitamix! Literally just made this and so I haven’t used it on anything, but I taste tested it and I am dying! It is AMAZING!! When I was told I should go dairy free, my biggest frustration was losing out on cheesy deliciousness. This recipe may have just rocked my world! Thanks! Help! I just made this and it turned into nut butter! The flavor was fabulous, and I followed the instructions exactly. How do I avoid this next time? I can’t stop eating it! So good. I made one adjustment: added one extra tbspoon nutritional yeast. I’m new to vegan cooking, and I live in Australia. I’ve read that nutritional yeast is sold in flakes here, not powder. One website said that when using powder rather than flakes, use half the amount. Thus, if I can only find flakes, does that change the quantities for this recipe? Hi! We are using flakes in this recipe! Not exactly sure how I’m supposed not to eat the whole thing in one go. It’s just divine. Do the cashews need to be soaked prior to making this recipe? Thanks in advance! Hi Whitney! Nope, not for this one! Do other varieties of nuts require soaking? For this recipe, unlike other cashew based recipes, you do not want the cashews to absorb water and become creamy. Instead, the cashews keep their nutty texture which makes for a more convincing parmesan cheese. 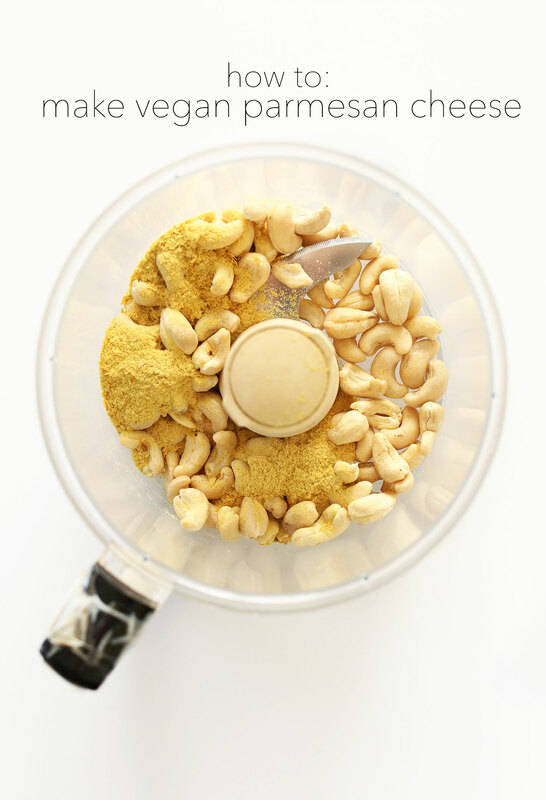 In other recipes such as a creamy vegan cheese or vegan cheesecake, you’d soak your cashews and then blend them in a food processor to achieve a creamy consistency, but this recipe is quite different from that. Hope this helps! I made this the first time exactly as written and it was marvelous. A great topping to have on hand and so easy to make. I just made it again, using walnuts instead of cashews, and I really like it this way, too! Not sure if I can choose :-) Thank you for the recipe. I have never used nutritional yeast before. While researching additional information, I found this statement: “I use the flaked version of nutritional yeast, but it’s also available in a powder. If you’re using the powder, you will need only about half as much as the flakes.” That’s a very big difference in volume, so I am wondering … In this recipe are you using flakes or powder? Hi RJ! In this recipe, we’re using flakes! First I want to thank you for getting back to me so quickly. Now you can tell this is all new to me. My grandson recently diagnosed allergic to cows milk, gluten, and egg. I hadn’t realized there were many people dealing with the same problem. Unfortunately I am still pretty dumb about all this. In your recipe for Parmesan cheese it calls for nutritional yeast. What is that exactly? Trying so hard to give up dairy and I have just made this Parmesan substitute following the recipe to the letter. I can hardly believe it. It is excellent! Though nothing compares with the real thing I am very happy with this and look forward to making it again using other nut types. When I bought the ingredients for this I also bought a ready made parmesan substitute which is nowhere near as good as this. Thank you Minimalist Baker. I always see different brands but never know what to trust. Thank you for your reliably great tasting recipes! Hi :) I’m thinking about making this recipe in the next few days (ABSOLUTELY in love with your blog btw) and I was wondering if I could solely add nutritional yeast rather than making vegan parm as well? -Do you know if it will have a big variance in flavor? Hi! 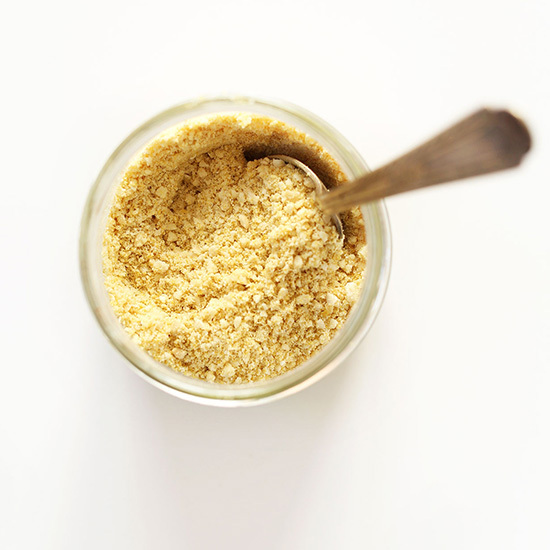 While nutritional yeast can be used by itself as a topping, Vegan Parmesan Cheese is just THAT much better! You are going to get a much richer and more flavorful product from the Vegan Parm! Hope this helps! Okay, I’ve had enough time to recover and feel I MUST share my thoughts…THIS IS, WITHOUT A DOUBT, THE BEST VEGAN PARMESAN CHEESE I’VE EVER TASTED! I couldn’t stop tasting it…over and over and over. I am so grateful to you for sharing this with us, thank you. I made this last night to top some pasta. I only have a magic bullet so there were some larger pieces of cashews. Should I blend this more, I did not want to turn it to dust? I also cannot taste the nutritional yeast, would it be okay to add a little more? Thanks! What is nutrisional yeast? Can i get it in Cape Town, South Africa? Hi! Nutritional yeast is a deactivated yeast, so it won’t make things rise & is not a replacement for yeast when baking. It has a cheesy, nutty flavor that you can use in sauces or as a topping! I am not sure if you can get it in Cape Town, South Africa but you can always order it online! Happy cooking! Hi Dana! Can I skip nutritional yeast or any substitution for it ? Just now thought to make vegan parmesan cheese , purchased Bragg’s n.yeast from ebay. It got passed it’s usage date. ?? Its not readily available and dont want to go for normal parmesan cheese…? Hi! I haven’t made it without the nutritional yeast but it seems as though others who also left comments have made the Vegan Parmesan Cheese without it and were successful in doing so! If you try it, let me know how it goes! OH MY GOD!!! The only thing I´ve been missing since becoming a vegan was parmesan. Well, not anymore. This recipe is mind-blowing, the vegan version tastes as good as the real thing. Even my mom, who is not vegan, mistook it for actual parmesan. Thank you so, so much!!! I think I pulsed this too long.. it become very mushy. It also tastes like cheese whiz? I’ll try another batch soon and report back! It should only be a loose meal! Definitely mixed too long. A few quick pulses. I just made this and it sort of turned into a paste instead of a flaky meal. I may have over blended it and the oil from the cashews came out and did this… Is this normal? What did I do wrong? Yeah, you overblended it! Just mix/pulse into a powder. I just wanted to say, that I am soo thankful for your allergy friendly recipes. I think that we’ve enjoyed all of the recipes, we’ve tried (especially the biscuits) I’m going to try this one tonight. My son can now have tree nuts, so I’m super excited! Thanks again from Texas!!! Do you use nutritional yeast flakes or seasoning? I’m new to this ingredient and veganism. This is delicious – thank you for the great recipe! Can this parm substitute be used for items baked in the oven – such as casseroles? Will it melt? Thanks again. Yes it can! Check out this recipe for an example. Unfortunately that’s the key ingredient in this recipe. But this isn’t an active yeast so should be fine. Could you sub cornstarch for the arrowroot starch? This recipe doesn’t call for either of those things. Oops! I meant to post that question under the vegan mac & cheese recipe. Sorry! This is the best version of a vegan parm I know of (also great without garlic for the non-garlic people). My challenge has been finding/creating a vegan pecorino romano recipe! That was the family favorite for Italian hard cheeses. Any thoughts? Hi – can this be used in baking? Or only as a topping? Hi Kara, we use it in baking. Such as in our Eggplant Parmesan and Simple Vegan Meatballs. Hope that helps! Is there a brand of nutritional yeast that you prefer? I’m looking for one that doesn’t taste so bitter. Any suggestions? I get mine in bulk at Whole Foods, but have heard good things about Braggs. I’m allergic to nuts – is there anything you can substitute cashews with? Yes! I’ve heard brazil nuts work wonders. I have been playing with vegan nut based cheese recipes and have had good results. Several posters have inquired about a substitute for the nutritional yeast. I have had concerns about the glutamic acid in nutritional yeast and try to minimize using it. I have had success using 1/2 teaspoon turmeric and 1/2 teaspoon of smoked paprika. My wife and I love your site. Thank you for being here! This was so easy and delicious!! I found it a teeny bit too salty, so I’ll use less salt less time. But it was so so good. I can see myself adding this on so many things that I eat. Thanks for sharing this recipe! I became vegetarian a few months back, and am slowly trying to use less animal products. I ran out of parmesan cheese, and remembered seeing this recipe. :-) I plated dinner, and told my husband I made vegan parmesan cheese. He was a little worried, but ended up adding a healthy portion to his dinner. We both give this recipe two thumbs up!! Loved this! So excited to have “cheese” for my pasta again. Thank you!! Hi! How long is the shelf life of this parmesan cheese? I keep mine in the fridge and I’d say it easily keeps for 1 month, if not longer. Thank you thank you thank you for this recipe! Since becoming vegan I had missed cheesy pizza and this vegan parm has brought it back in to my life. I’m blending this stuff up multiple times a week now. You’re the best! I don’t have any garlic powder, will it still taste good? Can I use crushed garlic or is it too wet? It may be too wet. Just leave it out and sprinkle on some fresh garlic to the actual dish for more flavor. Good luck! We haven’t tried this, but other readers have suggested using sunflower seeds (without the shell) as a nut alternative for the Vegan Parmesan Cheese. As for other recipes, it will definitely vary but sometimes tofu can be used in place of cashews! Check out the comments from other readers, they often have great suggestions for substitutions! I will second the sunflower seeds substitution – although I usually do part sunflower seeds, part cashews. Love this recipe, thank you! p.s. i want to see this in a chex party mix recipe!!! ……. hint hint! wow, i dont even know what to say! this flavor is what is missing in so many vegan cheeses. i am almost eating this with a spoon! i do believe that there are good, really good and bad yeast flake brands out there. the first one i tried was no good, i used my new brand for this recipe and i am bowled over with the taste, this is fab, you’re fab and this website is FAB!!! Which brand of yeast is good thanks? I’m not Dana but hope she won’t mind me answering your question. So no, no need to soak the cashews. Actually, that might lead to the ‘cheese’ going bad soon. This is AMAZING!!! Your proportions are SO spot on! Thank you thank you thank you!!! DELICIOUS. Couldn’t be happier with how it turned out. I LOVE this stuff! I’ve already made it three times since I discovered this recipe. It is sooooooooooo good! Thank you so much for this! I’m a flexitarian with a preference for lacto-ovo vegetarian food, but I’ve been eating more and more vegan meals. I LOVE my cheese, but I’ve had cashews in my freezer for ages, and have planned to make some vegan cheese substitutes with them. I finally got around to making your vegan Parmesan, and I’m HOOKED! Next step is to try your Green Chili Mac n Cheese. ? I’ve been making this in my Vitamix & i keep getting chunks of moisture that are for sure water ghosts because I start out with a dry machine. The part that crumbles is so delicious. Thanks for sharing. Really appreciate this yumma yum. I made this with roasted cashews instead of raw and I loved the additional nutty flavor of the roasted nuts! So good. I have this on hand in the fridge always! So as I sit here eating my perfected spag Bol recipe (which I’ve perfected over the past 2 years after going vegan) it still needed something more, something I’d missed… And then I found it! Well you actually! Thank you Dana this parmesean has brought so much joy to my little world – thank you!!! Do this need to be refrigerated? Or how long can it be kept? Hello ! I really want to make this however I dont have a food processor ! (cries for being too broke to afford them). will crushing the cashews without the food processor work and will mixing them using my hand work ?? You could definitely just finely chop! Or use a blender? I see this using soaked cashews that were well drained and it’s came out out quite wet, not like in the pictures at all. Any suggestions as to what I did wrong? Was still very tasty! Oh, you don’t use soaked cashews! Only raw or lightly roasted. This was absolutely delicious. My husband couldn’t believe how amazing it was, and went back for thirds! The best part was how low calorie it is, compared to regular lasagna with ricotta cheese. We finished it in about 3 days, and it tasted great with reheating too. This recipe is SUCH a gem, and you are an amazing chef! Thank you for having so many gluten-free vegan recipes – they are superb and fit my dietary needs perfectly! Made this last night, but I subbed sunflower seeds for the cashews. It’s GREAT! Exactly what I would want from vegan parm, plus it’s good for you! Thank you! Do you need to soak the nuts beforehand? I’d really love to try this recipe, however we can’t use nutritional yeast. Can this still be made by omitting that ingredient, or is there a substitute we could use? I’m sorry but that’s a central ingredient! We really loved this recipe. It was straightforward and easy to follow. We already finished the first batch and I am making another one tonight. The parmesan is great on pasta and I plan to try it as a seasoning when making homemade croutons. Any suggestions for cashews brands that aren’t cross contaminated with peanuts? Or just a replacer for those with nut allergies. I saw you suggest sunflower seeds. Can I buy them shelled? Is this the Parmesan you recommend to use in the Mac and Cheese? Absolutely perfect. I make this every week as we can’t live without it. Do I have to soak the cashews before blending? Nope! You can soak and then dry them thoroughly/roast slightly before to remove some phytic acid, but it’s not necessary. I see that u recommended finely ground almonds as a substitute for the cashews. Could I just use some almond flour/meal instead of processing them myself? Hmm, it will taste more almondy that you’d probably like. But if you try it, let me know how it goes! Macadamia nuts are the best side by side comparison. Thank u! May try all options to compare, will keep u posted. I am so grateful for the generosity of all of u vegan and Paleo bloggers! It has opened a whole new world of eating that has benefited my health, specifically inflammation! I have Hashimotos, higher-than-desired cholesterol and a strong family history of heart disease and diabetes that I am trying to avoid!!! Thank u again for sharing and making my journey easier and actually FUN! I just made this for the first time and tried it on pasta- wow! I was definitely pretty skeptical about vegan cheeses but I’ve loved every recipe of yours that I’ve tried, and I’m happy to report that this one did not disappoint! Seriously fantastic! Especially in an omni family it is nice to have yummy alternatives to share with them! Hi Dana! My son is allergic to ALL nuts. Is there an alternative and how much of it should I use? Hello Dana! I am new to your blog (love the pictures!) and this is the second recipe that I have tried. The baked Falafel burgers were amazing!! I am eager to try the lentil “meatballs” which calls for this as an ingredient. My interest in this recipe is actually twofold. One is that I am on a diet that restricts the amount of dairy and cheese that I am allowed to have. The comments on this recipe lead me to believe that this will be an unbelievable substitute. Second, I keep the rules of Kosher and cannot mix meat and dairy. How awesome does Chicken Parmesan sound? This could be the answer! I have never used nutritional yeast. When I opened the container, I thought the smell was reminiscent of fish food. The taste is eh. But hey, I’m game. I followed the recipe as precisely as possible (I only had kosher salt not sea salt on hand) and the result was fantastic. I am amazed!! It tasted great! Thank you for the recipe and all the other healthy recipes that I look forward to trying!! So great! Thanks for sharing, Reva! I’m new to your blog (I love your pictures) and this is the second recipe that I have tried. The baked falafel burgers were amazing!! and I want to try the lentil “meatballs” which calls for this as an ingredient. My interest in this recipe is twofold. One is that I’m on a diet that significantly reduces the amount of dairy and cheese that I am allowed to have and this has extremely high ratings as a great substitute. Second, I keep the laws of Kosher and cannot mix milk and meat products. How great does Chicken Parmesan sound! This could be the answer. I have never used nutritional yeast. When I opened the container I thought that the smell was reminiscent of fish food and the taste was eh. I’m not sure it tasted like cheese by itself. But hey, I’m game. I proceeded to make the recipe and I was incredibly surprised! It tasted really good! I even sent the recipe with your blog and a picture of what I made to a Vegan friend of mine! Thank you for the great recipes!! Amazing. It works well without garlic powder too . I absolutely love it. Can’t wait to try it on pasta! Woo-hoo! I was wondering about that! I can’t eat garlic. Thanks! It is great with walnuts too. Do the cashew nuts need to be soaked and dried prior to using? I’m looking forward to trying this out. Thanks! I could eat this by the spoonful. In fact, that’s exactly what I do sometimes. Put it on spaghetti and it tastes very similar to real parmesan. Just be careful about how long you pulse it, first time I made it was perfect, second time I pulsed it too long and it was not crumby anymore. How to get nutritional yeast in France??? Have you had any success making a Parmesan with other types of nuts? Should it store at the fridge? Just made a batch to top my black bean ‘meat’ balls, home made marinara sauce AND spaghetti squash. Wanted to include a pic but no way to do that. YUMMY!! What great flavor and texture! I used the Penzeys roasted garlic powder for an even bolder flavor. This will go on so many dishes I make to add the finishing touch. Can you use cashew butter? I want to put this on everything! I have wanted to try this for so long but was worried about the nutritional yeast. I get a lot of migraines and am sensitive to cultured food. Also MSG. There is so much out there in questions on wether it nutritional yeast has MSG or not. Do you know? And do you know how this product is made? Is it a cultured product like yogurt, etc. Thank you! There is no MSG in nutritional yeast however there is glutamic acid which is the basis of glutamate in MSG. The glutamate is the excitotoxin that can cause headaches and other symptoms. I need to go dairy free, and of course cheese is the hardest to give up. I like cashew cheeses but was extremely skeptical that this would taste similar to real Parmesan. I was so wrong! It tastes amazing, it’s giving me hope that I can actually go dairy free. Thanks!! This is a simple, quick and delicious topping and I always have some ready in the fridge. My partner loves it, perhaps even more than genuine Parmesan. Thanks Dana. Can you please tell me what and where I can find nutritional yeast? I feel really delighted to see this recipe. I haven’t tried it yet but I certainly will. When you have to go dairy free, cheese is the biggest sacrifice. This sounds good and I will try it as soon as i get the right ingredients together. What nutritional yeast do you use?! I’m from Brazil and i can’t find it here…so i want to a friend to bring it for me!! Wow!! My husband and I are not vegetarians, not vegans, but were having a dinner party that included a vegan friend. We decided to make the vegan pizza and wanted it to look like the pizza everyone else was being served. This vegan parmesan is so surprisingly parmesan like!!! We are going to be making it and using as a healthier choice, it’s that good! Oh, and the vegan pizza? It looked and tasted great! I have instant yeast instead of nutritional yeast. Does it work also? No, it’s completely different. Find some here. How long do you think this will keep in the fridge? do you think it will turn out well if i use fresh garlic instead of powder? thanks! Made it right after I read this. Add a little bit of salt for my taste. Fantastic! Thanks for sharing. Even better than regular parmesan! This is an absolutely amazing recipe. Thank you so much for sharing it! So simple and yet so tasty and 100% cruelty free! It added a real kick to my pasta and pizza dishes! I am eternally grateful. I just found your site and I’m fully convinced that you guys are rainbow farting unicorns. I love you! And thank you! I just had this problem! The first time I made this recipe it was amazing. The second time my food processor must have been damp. :( I was still able to crumble it over pizza though. Hi, newly veggo, aspiring vegan, and this looks awesome!! I can’t wait to try it! I wonder though, would this be best stored in the fridge or cupboard, in a sealed jar or air tight container? Also, how long would leftovers of this vegan cheese last? I eat A LOT of pasta (probably more than is good for me, haha! ), and this would be a great alternative to using regular dairy cheese. I always have a jar in the fridge now. I love that vegan staples can always be whipped up with items from the pantry, No milk, no problem if you have a almonds and a blender, for example…..
Hi Dana, I’m wondering if you can comment on an appropriate substitution for nutritional yeast in many of your recipes. As you may know, a common health issue in this country is the genetic variation MTHFR, which affects how your body processes B vitamins . Nutritional yeast is full of B vitamins and for some people eating nutritional yeast brings on serious symptoms, even though nutritional yeast companies may say that they don’t add things like folic acid. I am also interested in the substitute for Yeast please! I haven’t found a substitute exactly, but I’ve found if I leave out the yeast and tinker around with adding salt, pepper and granulated garlic until it tastes good, these kinds of recipes usually end up tasting okay without the yeast. Can I use roasted and lightly salted cashews instead of raw? Hi there just found your blog today , just trying to learn about becoming a vegan, so much to learn and I’m 74 , anyway I found your blog at a post someone put on vegan Richa for vegan Parmesan Cheese , just had to try it , just made some and it is awesome , thank you so much , will definitely check out your recipes and site , thanks again . I must admit I was extremely skeptical of this and in all honesty a bit irritated -how could it possibly taste like cheese? But my goodness was I wrong! It is absolutely wonderful and adds a real cheesy texture and taste. I have been a vegetarian for 25 years but a vegan for only about 6 months. I never thought I could give up cheese, but with such a wonderful substitute, that is environmentally friendly, animal kind and healthy whats to miss! Tomorrow I am going to try it on your Roasted Red Pepper Pasta. Thank you! This Nutritional yeast is the same of active dry yeast??? With the sea salt you did not mention if it was to be coarse or fine. I will comment later as tonight will be the first time that I try this out. I purchased coarse so I hope that will work. Using the coarse sea salt for this recipe worked just fine. My husband and I loved it sprinkled in our Caesar salad. I would of never guessed that this combination would taste like parmesan cheese. I had never heard of Nutritional Yeast. I look forward to trying more of your recipes in the future. Thank you. This was so delicious! I have a new vegan staple- yay! I added extra garlic, some almond slivers, and dried basil. Super delicious. Can I use cashews from a can? As long as they’re raw, yes. What a great knockoff … thank you so much! And easy, too! Thanks for bringing this recipe back, it’s one I have been making for decades. I first ran across it in the Ten Talents cookbook and have been making it ever since. I do very lightly toast the nuts after soaking and drying them, gives a great flavor. any soft nut like walnut, macadamia or pine works well, almonds too interestingly enough…just grind them a bit finer. bon appetit! Is there any substitute for garlic powder? I just realized I don’t have any, and I can’t make it to the store before this recipe needs to be done. I’ve NEVER left comments when I try a recipe from a blog; I’m just a find, try, eat kinda girl. This vegan parm is SO good I needed to leave you some love. I’ve also made your Mediterranean sweet potatoes several times now and since I’m here, I’m going to praise you for that as well! Your blog is my go to for my new vegan life style! This is great, so tasty! I just made it and I can’t wait to try it with some recipe. Thank you! this is great!! even my very non vegan husband gave me credit that it was good!! excited to use it in your vegan Alfredo pasta tonight!! Can vegan parmesan cheese be broiled and, if so, for how long? Would it be better to just sprinkle the pizzas with vegan parmesan cheese after taking them out of the oven and leave it at that? Thank you. I love your site and have learned a lot from it. Yes, it can be broiled. See this recipe for guidance! Though, hemp hearts have a little green tint but as long as that doesn’t bother you! Just tried this vegan parm for the first time and am in love! I can’t believe I can finally eat pizza without dairy. Thank you so much for sharing this awesome recipe! any options for those who cannot eat nuts? Trying to cook more plant based meals and my husband is allergic to nuts (with the exception of pine nuts). He can eat peanuts too. Hmm, what about sunflower seeds? Or hemp seeds? I’ve made this with just cashews and then 50/50 pine nuts and cashews and it was delicious both time the next time I was going to do it with 100% but can’t see it being anything but delicious based on the 50/50. I love this recipe. Can I use roasted cashews instead of raw? I think so, but I haven’t tried it so I can’t guarantee the results. Hi Dana, don’t cashews need soaking in water before using without roasting? I am dying to try this recipe but I would like to double check on the soaking requirement… Thank you! Hi Vivian! Not for this recipe, but you are right, for most cases! I used them :) It’s okay but the flavour is stronger and therefore it isn’t so similar to parmesan cheese. I had tried other vegan “Parmesans” before, and they were nice, but not gorgeous. Since I’ve never been a big fan of parmesan I didn’t care, but my husband wasn’t happy with them. This time, he just asked: “I suppose this parmesan isn’t real either?” so I think your recipe comes very, very close to the real thing! I blame the garlic powder, it’s the only difference I see to other recipes, or maybe the fact that I used sunflower seeds. So I’ll definitely stick to sunflower and garlic! Glad you like it, Melanie!! Thank you Dana and Mélanie as well ! I first tried it with cashews and it was great. After reading Mélanie’s comment, I made a batch with sunflower seeds and it was perfect, even better than the cashew one ! Added benefice, I have access to locally grown sunflower seeds (and nobody hurts their health shelling those) ! Did you use the same amount of sunflower seeds as it listed for cashews? Are the cashews and sunflower seeds unsalted? I did. And yes, unsalted ones, same as the cashews. Were they raw or toasted? so you used sunflower seeds instead of the cashew? same amount that the recipe said for cashew? you kept the same other ingredients? just replaced the raw cashew with unsalted sunflower seeds? How long can you keep it refrigerated? Exactly ! I don’t know. I’d say quite a long time, 3 months maybe – after that they’d go rancid I guess ? This is awesome! My husband cannot digest cashews too well so the sunflower substitute is great! Did you use raw or roasted? Raw :) but it might be good with roasted ! Can I make big batch and freeze? HI Dana! I love your recipes. Would you mind if I translated the ones I make to Portuguese and publish them in my blog? I will cite you as the creator of those delicious dishes and will add your website to the posts. Ok, I was of the “how good can this be?” mindset and I am completely blown away! I used a raw garlic clove because I didn’t have any garlic powder and I am eating it out of the food processor with a spoon as I write! Delicious! Can’t wait to put it on sautéed kale and butternut squash tonight! I can’t seem to find any nutritional yeast around where I live, will any other type of yeast work too? or any substitutes for this? BEST vegan cheese alternative ever. I don’t even like nutritional yeast (yes i know weird for a vegan to say lol) but this tastes JUST like parmesan when baked. I make garlic cheese bread, garlic cheese fries, and pizza with it. It’s amazing. even my non vegan family love it!!! I can’t use nutritional yeast or olive oil. What can I use as a substitute for these things? Hi! I have only recently discovered your blog. I’m in love with all your vegan recipes and tips. They are often harder to come across than usual diet types’. Really hugely grateful for them. Please keep them coming! So kind! Thanks for the kind words, Linh. Hope you enjoy the other recipes! I made your vegan parmesan to go along with your vegan alfredo recipe. I’ve been eating the parmesan by the spoonful – it is sooooooo delicious! I love nutrional yeast on my popcorn so I’m gonna try this on my popcorn next!